Obstructive Sleep Apnea; Surveys and Questionnaires; Validation; Sensitivity. Obstructive sleep apnea (OSA) is the most common sleep breathing disorder and manifests as repeated apneas and hypopneas during sleep.1–3 OSA increases the risk of hypertension, glucose intolerance, cardiovascular, and cerebrovascular disorders.4–7 Untreated OSA is also associated with daytime sleepiness, cognitive dysfunction, and increased risk of automobile accidents.8–10 Polysomnography (PSG) is the gold standard for the diagnosis of OSA, but it is an expensive and time-consuming and requires trained personnel. PSG is a noninvasive technique that involves overnight monitoring of several physiological variables including electroencephalography, eye movements, and muscle tone as well as respiratory effort, airflow, and oxygen saturation.11 Therefore, different clinical models have been developed to evaluate patients at high risk for OSA.12–14 Screening questionnaires are simple, low-cost tools that can be used to prioritize patients eligible for PSG. OSA screening questionnaires (OSA-SQs) were evaluated in surgical patients in a systematic review by Abrishami et al.15 In addition to being easy-to-use, the STOP and STOP-Bang questionnaires were found to have a higher methodological quality. Over the past few years, the accuracy of OSA-SQs has been an area of growing research interest and a number of studies have been published on the subject. This systematic review aimed to assess the accuracy of OSA-SQs including the Berlin questionnaire (BQ), STOP-Bang questionnaire (SBQ), STOP questionnaire (SQ), and Epworth Sleepiness Scale (ESS), based on an updated search of the literature. We performed a literature search using Medline, Cochrane Database of Systematic Reviews, and Scopus for articles published between January 2010 and April 2017 using the following terms: OSA or OSAHS (obstructive sleep apnea hypopnea syndrome), hypopnea or hypopnoea, obstructive sleep apnea or sleep apnea syndrome and sensitivity, specificity, validity, or validation, sleep apnea questionnaires, and screening sleep apnea. The reference list of identified studies was also searched manually to detect eligible studies for inclusion. The flow diagram of study selection process is depicted in Figure 1. Two authors independently reviewed the titles and abstracts of the search results and disagreements were solved in group discussion. The studies had to meet the following criteria to be included: a) participant age > 18 years; b) the accuracy of the screening questionnaire had been assessed against various apnea-hypopnea indexes (AHI) or respiratory disturbance indexes (RDI) based on PSG as the gold standard; and c) studies were published in English. We also included studies if the validity of screening questionnaires was reported as a secondary outcome. Letters to the editor, review articles, case reports, and commentaries were excluded. 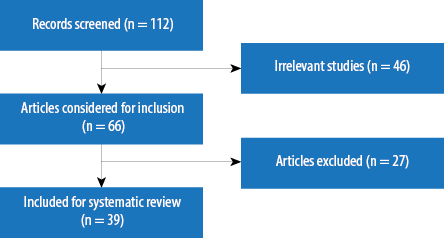 Two independent reviewers extracted the following information from each study that met the inclusion criteria: name of the first author, country and year of publication, study design, number of participants, age, gender, body mass index (BMI), neck circumference, validation tool (various types of PSG included), sensitivity, specificity, positive predictive value (PPV) and negative predictive value (NPV) for each AHI or RDI cut-off point including, AHI or RDI of ≥ 5 events/hour (mild OSA), ≥ 15 events/hour (moderate OSA), and ≥ 30 events/hour (severe OSA). Thirty-nine studies qualified for inclusion in the present review,11,16–54 with sample sizes ranging from 30 to 4770. These studies were carried out in seven different geographic regions including, North America,17,18,20,22,27,38,47,50,52 West Asia,11,16,24,29,30,42,51,53 East Asia,25,26,28,32,36,49,54 Europe,19,31,37,39,43,45,46 South Asia,40,48 North Africa,21,44 and South America.23,33–35 The results of our analysis of the relevant studies are presented below for each of the four OSA-SQs. Table 2 shows the BQ data for the sensitivity, specificity, PPV, and NPV for one or more AHI cut-off points as reported in the selected studies. The BQ highest sensitivity (97.3%) and NPV (95.4%) for the detection of OSA was found at AHI cutoffs ≥ 30 events/hour. However, the BQ had the highest detection specificity for moderate OSA (91.7%). Our analysis indicates a PPV ranging from 11.5% to 91% at AHI ≥ 5 events/hour. For the SBQ, we included 13 studies with a total 9584 subjects and sample sizes ranging from 85 to 4770. The studies mostly included sleep clinic patients with an age range of 42.8 to 62.4 years old [Table 1]. Overnight laboratory PSG was used as the validation tool in 10 studies.24,47,49 The highest sensitivity and NPV were reported at AHI thresholds of ≥ 30 events/hour. The PPV value ranged between 12.2% and 93.7% at AHI cutoffs ≥ 5 events/hour. The SBQ showed the highest specificity (74.7%) in detecting moderate OSA [Table 2]. Table 1: Overview of studies included looking at the accuracy of screening questionnaires for obstructive sleep apnea against polysomnography (PSG) as the reference test. Table 2: Predictive parameters of the screening questionnaires. AHI: apnea-hypopnea index; PPV: positive predictive value; NPV: negative predictive value. [Table 1]. The highest ESS sensitivity was observed at AHI ≥ 30 events/hour and ranged between 46.1% and 79.73%. However, the highest values for specificity (75%), NPV (87.5%), and PPV (96.7%) were found in mild OSA with a decreasing trend from mild to severe OSA [Table 2]. In light of the profound impact of OSA on the health and quality of life,5,18,40 it is essential that patients are adequately screened to receive the necessary medical care. It is estimated that over 80% of people with moderate to severe OSA remain undiagnosed.60 Thus, a screening tool is necessary to stratify patients based on their clinical symptoms and anthropometric risk factors. Some easy-to-use questionnaires have been developed as low-cost alternatives to PSG for detecting OSA. In this review, we assessed the accuracy of four self-reported OSA-SQs against PSG as the reference test. The SBQ had the highest sensitivity for the prediction of mild and severe OSA (97.55% and 98.7%, respectively). However, the BQ showed the highest specificity for the detection of mild and severe OSA (90% and 80%, respectively). Compared to other questionnaires, the SQ had the highest sensitivity (100%) and specificity (92.3%) for predicting moderate OSA. The validity of our results for the general population may be questioned based on the fact that most of the subjects in the studies we reviewed were sleep clinic patients where the prevalence of OSA is relatively high. In addition, there is no standard definition of OSA unifying the various validation studies. Features of an appropriate screening questionnaire vary according to the population being surveyed. For example, cultural differences in urban and rural populations require the questionnaire is modified according to those being surveyed. However, it must be noted that it was not our objective of this review. Diagnosis of true positive OSA patients in a clinical setting using a questionnaire with high sensitivity minimizes negative health consequences and avoids unnecessary and costly diagnostic tests. PSG, the gold standard for OSA diagnosis, is an expensive and time-demanding procedure. Therefore, it is necessary to decrease the number of false-positive subjects in the general population using a screening tool with high specificity. An effective screening tool must also have a high sensitivity to minimize the number of false negatives. There was no standard definition for OSA in various studies that investigated the validity of OSA screening questionnaires against PSG. of OSA significantly affects the accuracy of validation studies. Therefore, it is necessary to test the validity of various OSA-SQs in the general population against the reference standard PSG. Because sleep clinic patients constituted the majority of the subjects in the reviewed studies, it is not possible to extend our conclusions to the general population. SBQ and SQ are appropriate screening tools to determine OSA in sleep clinic patients. Further validation studies designed specifically for the general population are necessary. 1. Marshall NS, Wong KK, Liu PY, Cullen SR, Knuiman MW, Grunstein RR. Sleep apnea as an independent risk factor for all-cause mortality: the Busselton Health Study. Sleep 2008 Aug;31(8):1079-1085. 2. Young T, Finn L, Peppard PE, Szklo-Coxe M, Austin D, Nieto FJ, et al. Sleep disordered breathing and mortality: eighteen-year follow-up of the Wisconsin sleep cohort. Sleep 2008 Aug;31(8):1071-1078. 3. Young T, Peppard PE, Gottlieb DJ. Epidemiology of obstructive sleep apnea: a population health perspective. Am J Respir Crit Care Med 2002 May;165(9):1217-1239. 4. Peppard PE, Young T, Palta M, Skatrud J. Prospective study of the association between sleep-disordered breathing and hypertension. N Engl J Med 2000 May;342(19):1378-1384. 5. Punjabi NM, Ahmed MM, Polotsky VY, Beamer BA, O’Donnell CP. Sleep-disordered breathing, glucose intolerance, and insulin resistance. Respir Physiol Neurobiol 2003 Jul;136(2-3):167-178. 6. Redline S, Yenokyan G, Gottlieb DJ, Shahar E, O’Connor GT, Resnick HE, et al. Obstructive sleep apnea-hypopnea and incident stroke: the sleep heart health study. Am J Respir Crit Care Med 2010 Jul;182(2):269-277. 7. Shahar E, Whitney CW, Redline S, Lee ET, Newman AB, Nieto FJ, et al. Sleep-disordered breathing and cardiovascular disease: cross-sectional results of the Sleep Heart Health Study. Am J Respir Crit Care Med 2001 Jan;163(1):19-25. 8. George CF, Boudreau AC, Smiley A. Effects of nasal CPAP on simulated driving performance in patients with obstructive sleep apnoea. Thorax 1997 Jul;52(7):648-653. 9. Pichel F, Zamarrón C, Magán F, Rodríguez JR. Sustained attention measurements in obstructive sleep apnea and risk of traffic accidents. Respir Med 2006 Jun;100(6):1020-1027. 10. Ruehland WR, Rochford PD, O’Donoghue FJ, Pierce RJ, Singh P, Thornton AT. The new AASM criteria for scoring hypopneas: impact on the apnea hypopnea index. Sleep 2009 Feb;32(2):150-157. 11. Amra B, Nouranian E, Golshan M, Fietze I, Penzel T. Validation of the persian version of berlin sleep questionnaire for diagnosing obstructive sleep apnea. Int J Prev Med 2013 Mar;4(3):334-339. 12. Kushida CA, Littner MR, Morgenthaler T, Alessi CA, Bailey D, Coleman J Jr, et al. Practice parameters for the indications for polysomnography and related procedures: an update for 2005. Sleep 2005 Apr;28(4):499-521. 13. Ramachandran SK, Josephs LA. A meta-analysis of clinical screening tests for obstructive sleep apnea. Anesthesiology 2009 Apr;110(4):928-939. 14. Manzar MD, Moiz JA, Zannat W, Spence DW, Pandi-Perumal SR, Hussain ME; BaHammam AS. Validity of the Pittsburgh Sleep Quality Index in Indian University Students. Oman Med J 2015 May;30(3):193-202. 15. Abrishami A, Khajehdehi A, Chung F. A systematic review of screening questionnaires for obstructive sleep apnea. Can J Anaesth 2010 May;57(5):423-438. 16. Alhouqani S, Al Manhali M, Al Essa A, Al-Houqani M. Evaluation of the Arabic version of STOP-Bang questionnaire as a screening tool for obstructive sleep apnea. Sleep Breath 2015 Dec;19(4):1235-1240. 17. Best MW, Fitzpatrick M, Milev R, Bowie CR, Jokic R. Utility of the Berlin questionnaire for predicting obstructive sleep apnea in individuals with treatment-resistant depression. Sleep Breath 2013 Dec;17(4):1221-1227. 18. Bhat S, Upadhyay H, DeBari VA, Ahmad M, Polos PG, Chokroverty S. The utility of patient-completed and partner-completed Epworth Sleepiness Scale scores in the evaluation of obstructive sleep apnea. Sleep Breath 2016 Dec;20(4):1347-1354. 19. Bouloukaki I, Komninos ID, Mermigkis C, Micheli K, Komninou M, Moniaki V, et al. Translation and validation of Berlin questionnaire in primary health care in Greece. BMC Pulm Med 2013 Jan;13:6. 20. Boynton G, Vahabzadeh A, Hammoud S, Ruzicka DL, Chervin RD. Validation of the STOP-BANG Questionnaire among Patients Referred for Suspected Obstructive Sleep Apnea. J Sleep Disord Treat Care 2013 Sep;2(4). 21. El-Sayed IH. Comparison of four sleep questionnaires for screening obstructive sleep apnea. Egyptian Journal of Chest Diseases and Tuberculosis. 2012;61(4):433-441. 22. Enciso R, Clark GT. Comparing the Berlin and the ARES questionnaire to identify patients with obstructive sleep apnea in a dental setting. Sleep Breath 2011 Jan;15(1):83-89. 23. Faria AC, da Costa CH, Rufino R. Sleep Apnea Clinical Score, Berlin Questionnaire, or Epworth Sleepiness Scale: which is the best obstructive sleep apnea predictor in patients with COPD? Int J Gen Med 2015 Aug;8:275-281. 24. Firat H, Yuceege M, Demir A, Ardic S. Comparison of four established questionnaires to identify highway bus drivers at risk for obstructive sleep apnea in Turkey. Sleep Biol Rhythms 2012;10(3):231-236. 25. Gantner D, Ge JY, Li LH, Antic N, Windler S, Wong K, et al. Diagnostic accuracy of a questionnaire and simple home monitoring device in detecting obstructive sleep apnoea in a Chinese population at high cardiovascular risk. Respirology 2010 Aug;15(6):952-960. 26. Ha SC, Lee DL, Abdullah VJ, van Hasselt CA. Evaluation and validation of four translated Chinese questionnaires for obstructive sleep apnea patients in Hong Kong. Sleep Breath 2014 Dec;18(4):715-721. 27. Hesselbacher S, Subramanian S, Allen J, Surani S, Surani S. Body mass index, gender, and ethnic variations alter the clinical implications of the epworth sleepiness scale in patients with suspected obstructive sleep apnea. Open Respir Med J 2012;6:20-27. 28. Kang K, Park KS, Kim JE, Kim SW, Kim YT, Kim JS, et al. Usefulness of the Berlin Questionnaire to identify patients at high risk for obstructive sleep apnea: a population-based door-to-door study. Sleep Breath 2013 May;17(2):803-810. 29. Karakoc O, Akcam T, Genc H, Yetkin S, Piskin B, Gerek M. Use of the Berlin Questionnaire to screen at-risk patients for obstructive sleep apnea. B-ENT 2014;10(1):21-25. 30. Khaledi-Paveh B, Khazaie H, Nasouri M, Ghadami MR, Tahmasian M. Evaluation of Berlin Questionnaire Validity for Sleep Apnea Risk in Sleep Clinic Populations. Basic Clin Neurosci 2016 Jan;7(1):43-48. 31. Kiciński P, Przybylska-Kuć SM, Tatara K, Dybała A, Zakrzewski M, Mysliński W, et al. Reliability of the Epworth Sleepiness Scale and the Berlin Questionnaire for screening obstructive sleep apnea syndrome in the context of the examination of candidates for drivers. Med Pr 2016 Dec;67(6):721-728. 32. Kim B, Lee EM, Chung YS, Kim WS, Lee SA. The utility of three screening questionnaires for obstructive sleep apnea in a sleep clinic setting. Yonsei Med J 2015 May;56(3):684-690. 33. Margallo VS, Muxfeldt ES, Guimarães GM, Salles GF. Diagnostic accuracy of the Berlin questionnaire in detecting obstructive sleep apnea in patients with resistant hypertension. J Hypertens 2014 Oct;32(10):2030-2036, discussion 2037. 34. Martinez D, da Silva RP, Klein C, Fiori CZ, Massierer D, Cassol CM, et al. High risk for sleep apnea in the Berlin questionnaire and coronary artery disease. Sleep Breath 2012 Mar;16(1):89-94. 35. Nunes FS, Danzi-Soares NJ, Genta PR, Drager LF, Cesar LA, Lorenzi-Filho G. Critical evaluation of screening questionnaires for obstructive sleep apnea in patients undergoing coronary artery bypass grafting and abdominal surgery. Sleep Breath 2015 Mar;19(1):115-122. 36. Ong TH, Raudha S, Fook-Chong S, Lew N, Hsu AA. Simplifying STOP-BANG: use of a simple questionnaire to screen for OSA in an Asian population. Sleep Breath 2010 Dec;14(4):371-376. 37. Pataka A, Daskalopoulou E, Kalamaras G, Fekete Passa K, Argyropoulou P. Evaluation of five different questionnaires for assessing sleep apnea syndrome in a sleep clinic. Sleep Med 2014 Jul;15(7):776-781. 38. Pereira EJ, Driver HS, Stewart SC, Fitzpatrick MF. Comparing a combination of validated questionnaires and level III portable monitor with polysomnography to diagnose and exclude sleep apnea. J Clin Sleep Med 2013 Dec;9(12):1259-1266. 39. Popević MB, Milovanović A, Nagorni-Obradović L, Nešić D, Milovanović J, Milovanović AP. Screening commercial drivers for obstructive sleep apnea: translation and validation of Serbian version of Berlin Questionnaire. Qual Life Res 2016 Feb;25(2):343-349. 40. Prasad KT, Sehgal IS, Agarwal R, Nath Aggarwal A, Behera D, Dhooria S. Assessing the likelihood of obstructive sleep apnea: a comparison of nine screening questionnaires. Sleep Breath 2017 Dec;21(4):909-917. 41. Punjabi NM, Caffo BS, Goodwin JL, Gottlieb DJ, Newman AB, O’Connor GT, et al. Sleep-disordered breathing and mortality: a prospective cohort study. PLoS Med 2009 Aug;6(8):e1000132. 42. Sadeghniiat-Haghighi K, Montazeri A, Khajeh-Mehrizi A, Ghajarzadeh M, Alemohammad ZB, Aminian O, et al. The STOP-BANG questionnaire: reliability and validity of the Persian version in sleep clinic population. Qual Life Res 2015 Aug;24(8):2025-2030. 43. Sagaspe P, Leger D, Taillard J, Bayon V, Chaumet G, Philip P. Might the Berlin Sleep Questionnaire applied to bed partners be used to screen sleep apneic patients? Sleep Med 2010 May;11(5):479-483. 44. Saleh AB, Ahmad MA, Awadalla NJ. Development of Arabic version of Berlin questionnaire to identify obstructive sleep apnea at risk patients. Ann Thorac Med 2011 Oct;6(4):212-216. 45. Scarlata S, Pedone C, Curcio G, Cortese L, Chiurco D, Fontana D, et al. Pre-polysomnographic assessment using the Pittsburgh Sleep Quality Index questionnaire is not useful in identifying people at higher risk for obstructive sleep apnea. J Med Screen 2013 Dec;20(4):220-226. 46. Sforza E, Chouchou F, Pichot V, Herrmann F, Barthélémy JC, Roche F. Is the Berlin questionnaire a useful tool to diagnose obstructive sleep apnea in the elderly? Sleep Med 2011 Feb;12(2):142-146. 47. Silva GE, Vana KD, Goodwin JL, Sherrill DL, Quan SF. Identification of patients with sleep disordered breathing: comparing the four-variable screening tool, STOP, STOP-Bang, and Epworth Sleepiness Scales. J Clin Sleep Med 2011 Oct;7(5):467-472. 48. Srijithesh PR, Shukla G, Srivastav A, Goyal V, Singh S, Behari M. Validity of the Berlin Questionnaire in identifying obstructive sleep apnea syndrome when administered to the informants of stroke patients. J Clin Neurosci 2011 Mar;18(3):340-343. 49. Tan A, Yin JD, Tan LW, van Dam RM, Cheung YY, Lee CH. Predicting obstructive sleep apnea using the STOP-Bang questionnaire in the general population. Sleep Med 2016 Nov-Dec;27-28:66-71. 50. Thurtell MJ, Bruce BB, Rye DB, Newman NJ, Biousse V. The Berlin questionnaire screens for obstructive sleep apnea in idiopathic intracranial hypertension. J Neuroophthalmol 2011 Dec;31(4):316-319. 51. Ulasli SS, Gunay E, Koyuncu T, Akar O, Halici B, Ulu S, et al. Predictive value of Berlin Questionnaire and Epworth Sleepiness Scale for obstructive sleep apnea in a sleep clinic population. Clin Respir J 2014 Jul;8(3):292-296. 52. Vana KD, Silva GE, Goldberg R. Predictive abilities of the STOP-Bang and Epworth Sleepiness Scale in identifying sleep clinic patients at high risk for obstructive sleep apnea. Res Nurs Health 2013 Feb;36(1):84-94. 53. Yüceege M, Fırat H, Sever Ö, Demir A, Ardıç S. The effect of adding gender item to Berlin Questionnaire in determining obstructive sleep apnea in sleep clinics. Ann Thorac Med 2015 Jan-Mar;10(1):25-28. 54. Yunus A, Seet W, Mohamad Adam B, Haniff J. Validation of the Malay version of Berlin questionaire to identify Malaysian patients for obstructive sleep apnea. Malays Fam Physician 2013 Apr;8(1):5-11. 55. Netzer NC, Stoohs RA, Netzer CM, Clark K, Strohl KP. Using the Berlin Questionnaire to identify patients at risk for the sleep apnea syndrome. Ann Intern Med 1999 Oct;131(7):485-491. 56. Nieto FJ, Young TB, Lind BK, Shahar E, Samet JM, Redline S, et al. Association of sleep-disordered breathing, sleep apnea, and hypertension in a large community-based study. Sleep Heart Health Study. JAMA 2000 Apr;283(14):1829-1836. 57. Chung F, Yegneswaran B, Liao P, Chung SA, Vairavanathan S, Islam S, et al. STOP questionnaire: a tool to screen patients for obstructive sleep apnea. Anesthesiology 2008 May;108(5):812-821. 58. Johns MW. A new method for measuring daytime sleepiness: the Epworth sleepiness scale. Sleep 1991 Dec;14(6):540-545. 59. Peracchia C, Anaizi NH. Control of breathing. Lung function in health and disease. 1st ed. 2014. p. 197-214. 60. Young T, Palta M, Dempsey J, Skatrud J, Weber S, Badr S. The occurrence of sleep-disordered breathing among middle-aged adults. N Engl J Med 1993 Apr;328(17):1230-1235.